Ever wonder what’s inside those young adult (YA) books? Well, you might be surprised, probably shocked if you are a parent. Ink Spells’ purpose is to help review books for the middle grades (ages 8-12) with content advisories and ratings. Why? Because advanced readers often read way ahead of their grade level, and finding appropriate reading material became a mission of necessity for me, with my 3 advanced reading boys. But as they rocket toward teenhood (Dark Omen is 11 going on 16), and as I write YA books, I am increasingly aware that the truly shocking stuff is generally in YA. I don’t mean to spark a censorship vs. Free Speech debate here. Suffice to say, I’m I huge believer in Free Speech, and I think parents have a responsibility to monitor their children. But they need help. Ink Spells is here to help with Middle Grade books. Teen Reader is here to help with those Young Adult books. I recently came across the Teen Reader website, and accompanying blog, and couldn’t be happier! Andye’s site is like a teen version of Ink Spells, only more organized and even has a section for guys! Andye has the right idea about providing information for parents, and teens, so they can make their own informed decisions. And hopefully talk about the material contained in some of the more explicit or disturbing books. We can’t insulate kids from every horror in the world, but as parents (and teachers and librarians), I believe we have a responsibility to help teens make that crucial stretch from kid to adult with values intact. Teen Reader is a great resource to help parents do just that. « Ink Spells Can’t Wait for The Red Pyramid! My blog, Books for Boys http://booksandboys.blogspot.com is dedicated to drawing attention to the importance of reading. And my new book, Lost Island Smugglers – first in the Sam Cooper Adventure Series – is coming out in July-August. Contracts are also signed for Captain Jack's Treasure and River Rampage. @Max Congrats on your many books! And your consistent efforts to draw attention to reading quality books. Bravo! Until I started reviewing books, I hadn't ventured into the YA area. While I've only read a few, those that I have read have contained mature content that I found a little shocking. When my daughter reaches the teen years, if she decides to read this genre I hope she'll be game for some open and frank conversations about the content in the books. @Brimful Open and frank discussion is the best route, no matter what. I openly talk to my kids about WHY I don't want them to read certain things ("too much violence" "boy/girl stuff") which is (hopefully) giving them a way to critique thier own reading as they get older. Thank for the great resource, Susan. For advanced middle graders who are drawn to YA books, it will be a deeeply appreciated way for their parents to check out the requested books. THE BLUE GIRL by the talented author, Charles de Lint, is a YA urban fantasy I have to be careful in recommending, considering the age and maturity of the young person I'm talking to. Sometimes the teenage children of some of my blog-friends want to visit my blog, too. Since I write middle grade and YA fantasy as well as historical & urban fantasy, I luckily have posts I can direct them to. So true, that we can't insulate our kids from the world. It just isn't fair, or realistic, to them. Dialogue and conversation go a long way to bringing about understanding for them, and what wonderful tools stories and books can be to spark those talks. Hi Susan, thanks for following and commenting! It's always nice to meet fellow authors. @Joanne Some of the best talks have come out of stories my kids have read – subjects that I would never have been able to naturally broach come out comfortably when we are talking about a character in that sticky situation. @Amelia – I'm so glad you like the post! And even more pleased that you try to put content advisories in your reviews. I'll have to check out screenit.com, but I heavily use http://www.commonsensemedia.org for books, movies, and even websites and games. Thanks for stopping by and I hope you'll come back! Thanks again for featuring my blog! I've already told my friends about your blog!! My 10yo son came home yesterday asking if he could read Ender's Game because the librarian recommended it. I've read the book and I'm not really sure why it's considered middle grade. The children in the story are certainly not normal and the violence and language qualify it as YA to me. It bothered me that the librarian was recommending it to 5th graders. I read a lot, both MG and YA, but a lot of parents are completely clueless. Of course, like you Susan, I wonder how much longer I'll have any sway with what my son reads. It's so hard with advanced readers to find books they enjoy that are appropriate. That's why I really love your reviews. Thank you for writing this post. Many parents do not realize that they need to monitor the content of YA books, which have a wide range of maturity levels. One that's appropriate for a 16 or 17 year old is quite possibly inappropriate for a 12 or 13 year old. It's kind of like an R rated movie versus a PG-13 one, but it's impossible to distinguish between the two from the cover and title alone. While I can't read every book my children (ages 12 and 14) read, I do take time out to monitor their selections "from a distance." I'll often read the book jacket and the Amazon reviews. If I find that they're reading something with mature content, I am sure to read it soon after myself. That way, we can discuss any sensitive issues which otherwise would not have come up. Like you, I don't believe in banning books, but I do believe that parents have the right to ask their children to put off reading certain reading material for a few years (if they can with movies, why not books?). If a child really insists on reading a book, though, I would either read it with her or him, or read it myself and then start a conversation about any mature themes. Reading YA books can be such an enjoyable experience for adults, and reading them along with your tween or teen can help spark so many great conversations. It's a wonderful way to get to know your child better! Thank you again for bringing up such an important topic, and for reminding us that it's not just young children who need help in seeking out the best and most appropriate reading materials. @Sherrie Precisely because even teachers and librarians have different "sensitivity" points, it's important for parents, the last rampart of defense, to be in the know. Ender's Game is one that I hear rec'd all the time for MG kids, and when I say things like, "Just because it has an 11 year old protagonist, doesn't mean it should be read by 11 year olds," people often give me puzzled looks. THIS actually points back to the responsibility of authors, publishers, and bookstores to place books on the appropriate shelf. I won't go as far as saying that Orson Scott Card (who I greatly admire and have long read) shouldn't have written Ender as an 11 year old, and I know Orson did not write Ender's Game as a children's book – but some appropriate marketing could help warn parents. Ditto Hunger Games. @Dawn I like your idea of "delay not ban" and in fact we practice that at our house. My boys are so accustomed to having "age limits" set on books/games/movies that they automatically ask me, "Mom, what's the age on Civilization IV?" to see if they can play it. This also has the side benefit of when they "reach" the appropriate age for a given book/movie/game, they are excited beyond belief and feel a sense of accomplishment in their growning maturity. For me, it's a sad reminder of how quickly their young years are passing by. And I heartily agree that some YA is appropriate for 15+ but not for 13-14 year olds, who are particularly impressionable freshly-minted teens. And then there are some YA books that I, as an adult, will NEVER want to read. I've talked to my kids about that as well – that it is okay to not want certain very violent or disturbing thoughts or images in your head, via a book or movie. I hope when they are old enough, they will have the tools to make those choices for themselves. This is the way parents should censor books–by reading them and determining what is appropriate, individually, for their own children. Good stuff! When I was younger I was horrified at the idea of censoring books for kids, but now that I'm a parent I'm in full support of it. I'm troubled by the fact that children today are reading about relationships and dating at an age that this should no way be a part of their lives. I realize that my point of view has to do a lot with my own lifestyle and the Orthodox Jewish community that I live in, but I don't think it wouldn't hurt others to think in the same way. Oh, and thanks for stopping by my blog, via the blog hop. I'm really enjoying looking around yours. @beth Knowing your own kids is the key to just about all parenting, IMHO. AND EVERYBODY: Beth has a 3 book deal to bring out one of those lovely YA Science Fiction novels I've been pining for! So check her out! I think everyone should realize the investment in the future that children (mine, yours, everyone's) represent. These people are going to be running the place when we retire (actually sooner!). So, let's do our best by them, yeh? But exactly because each family has their own value system, there needs to be resources to support parents in making the decisions right for their families. And the easier it is, the more people will take the time to monitor what their kids are reading/watching/playing. Thank you Susan for featuring Reading Teen. It's nice to hear feedback and have a little support for our little blog. Andye and I both have teens who love to read YA books, so we had to get in the action to see what these books are all about. 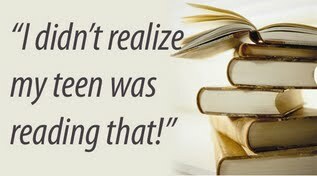 Obviously, I was shocked to read some of the content found in some books that are written for 13 to 18 yrs. of age. Hopefully, we are making a small difference out there, opening some eyes! I forgot to tell you that your blog is great! I am now a follower, here to support your cause. @Aaronswoman Thanks for the support and the follow! 🙂 And thanks for all you do to put information in parents' hands about YA books. As has been mentioned above, what's fine for an 18 year old is very different than what's appropriate for a 13 year old – and parents are the key to discerning that. Content warning is not the same censorship, or ratings. Its good there is a site that reviews books and gives honest content reports. As a working parent, it isn't feasaable for me to pre-read every book my kids pick up. So it's up to me to search out books he's either bringing home, or possiblilites for purchase. Resources are so important for that. Thanks to both sites for the concern and info. As a YA writer, my bookshelves are full on novels for girls 14+. Lots of romance. My 10yo son is now reading YA books, but I have to steer him away from a lot of the books. The level of romance is way too much for his age, if you know what I mean. Good on you for keeping watch over the kiddos!